"Pokémon Red Version and Blue Version (ポケットモンスター 赤・緑, Poketto Monsutā Aka Midori, "Pocket Monsters: Red & Green") are role-playing games developed by Game Freak and published by Nintendo for the Game Boy. They are the first installments to the Pokémon series. They were first released in Japan in 1996 and later released in North America, Europe and Australia over the following three years. Pokémon Yellow, a special edition version, was released roughly a year later. 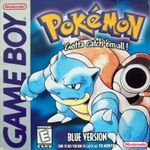 Red and Blue have subsequently been remade for the Game Boy Advance as Pokémon FireRed and LeafGreen, released in 2004. The player controls the main character from an overhead perspective and navigates him throughout the fictionalized region of Kanto in a quest to master Pokémon battling. The goal of the games is to become the Champion of the region by defeating the top four Pokémon trainers in the land, the Elite Four. Another objective is to complete the Pokédex, an in-game encyclopedia, by obtaining the 150 available Pokémon. Red and Blue also utilize the Game Link Cable, which connects two games together and allows Pokémon to be traded or battled with between games. Both titles are independent of each other but feature largely the same plot and, while they can be played separately, it is necessary for players to trade among the two in order to obtain all 150 Pokémon." Source: Wikipedia, "Pokémon_Red," available under the CC-BY-SA License. Pokemon Fan- Pikachu, I Choose You!